The incident was captured by an Associated Press photographer when it occurred at a "Make America Great Again" rally in Evansville, Indiana. 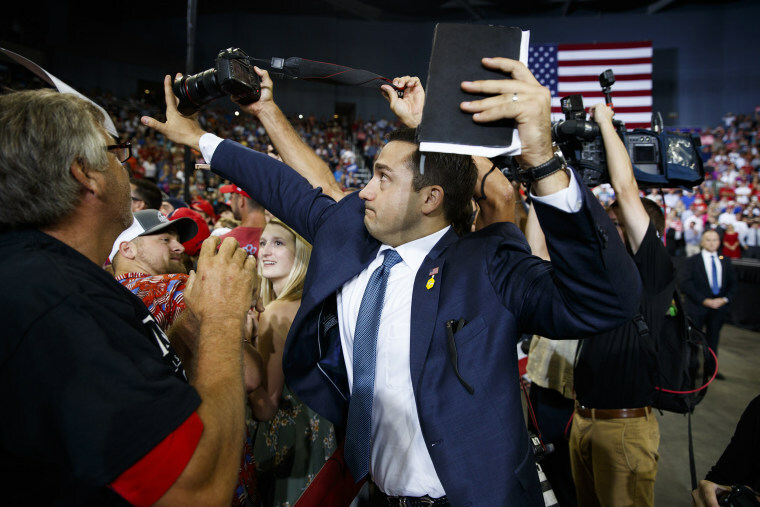 The White House Correspondents' Association said Friday that the Trump campaign has taken action against the volunteer who tried to block a photographer from taking photos of a protester during a Thursday night rally. "The Trump campaign assures me that these were the actions of an inexperienced volunteer, who understands that he acted in error," WHCA president Olivier Knox said in a statement. "The campaign has taken him off the road, and promises that this will not happen again." The incident was captured by an Associated Press photographer when it occurred at a "Make America Great Again" rally in Evansville, Indiana, when a female protester interrupted Trump's speech, and displayed her middle finger when the crowd razzed her. "Where the hell did she come from?" Trump asked as the protester was escorted out while the crowd booed.